At Picnik, one of our favorite times of year is Halloween. We get a bit giddy anticipating our braaaaainstorm session for this holiday. We love dreaming up ghouls and ghosts that bring spookiness to your photos. This October we brought back mob favorites; like Vampire and Zombie, Lightning and Ghostify. 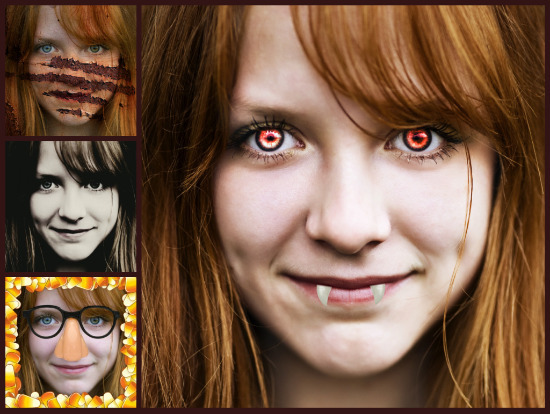 And we've introduced new effects to add eeriness with one-click, unearthly textures and heaps of new stickers. Halloween Effects: Feeling beastly? Our mad scientists created tools to turn you into a zombie, vampire or other creature of the dark. Plus, many other effects to give your photo a mysterious cast. Halloween Stickers: We crawled up to the attic and dusted off trunks full of stickers, so you can add everything from witch hats, ghosts, and jack-o-lanterns to tombstones, fangs, lesions and bats. Halloween Fonts: We unearthed some of the spookiest fonts around so you can add text to your photo written in skeletons, ghosts or other treacherous text. To find these fiendish delights, go to picnik.com/halloween. This Halloween, you can dress up your photos without even putting on a costume..